Versatile live drum loops for ska! 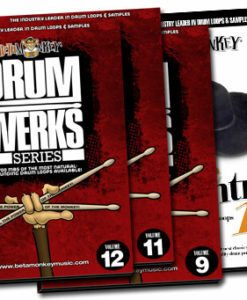 With a wealth of ska drum loops and fills, Drum Werks XXII is our exclusive collection of Ska drumming at its finest. Performed by one of the top session players in L.A., this sample download pack is versatile enough for traditional as well as modern interpretations of the ska genre. Drum Werks XXII Ska Grooves is also the perfect companion disc to Drum Werks XXI: Reggae Grooves. Take a Steppers beat and lay it down at a much higher tempo and you have the essence of ska. Featured grooves on Drum Werks XXII Ska Grooves are played with straight and triplet swing feels. Drum Werks XXII delivers live ska drum loops with multiple beat variations and a robust collection of fills. With a boost in tempos and energy, the drum grooves feature side stick grooves, half-time and up-tempo rhythms, and straight/swing feels. Fills include intros as well as transitions, featuring snare, side stick, and tom rolls. Drum Werks XXII will lay down the groove foundation for any traditional ska project, providing the slinky funk and uptempo energy you need. 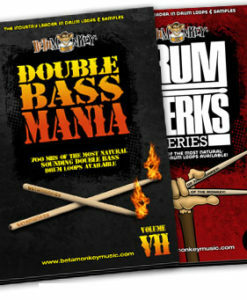 This collection of ska drum loops is also ideal for any ska and reggae influenced music like Drum & Bass, dub or Dubstep. Featuring a Single Session sample collection (all drums recorded and mixed from a single recording session), mixing is easy and efficient. And, with more multiple-bar loops (four and eight bars) you get the realism your drum tracks deserve. Versatile Blend of Ska and Rock-Ska Styles: Over 600 ska grooves and groove variations ranging from 50 bpm to 200 bpm. Includes basic grooves as well as more syncopated accented ones, with full snare shots and cross-sticking. Perfect for modern ska and rock-reggae hybrid styles The perfect companion to Drum Werks XXI Reggae Drums – pure, ska-inspired rhythms for a variety of musical settings. Fully-Sampled Drum and Cymbal Samples: A multi-velocity samples of a Yamaha Phoenix drumkit as well as matching Zildjian cymbals is included. Build new grooves in your sequencer of choice or augment the loops to create new syncopations. Superior Rhythmic Realism: No programmed grooves here. Live, studio grooves show you what a live drummer can do – capture the elusive essence of grooves that exist between straight and swung groove feels. A dynamic arsenal of live ska grooves. Cohesive Groove Sets: All loops and samples are from a single recording session. All loops can be combined seamlessly giving users the ultimate in consistency for eclectic or larger-scale projects. 631 (1.01 GB in 24-bit WAV and Apple Loops; 694 MB in 16-bit WAV) original, license-free drum loops and samples in 16-bit, 24-bit WAV, APPLE LOOPS formats. 174 (211 MB) multi-velocity drum and cymbal samples. 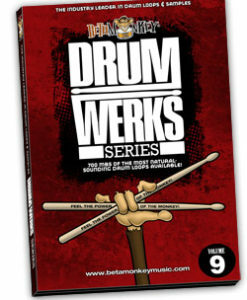 Same sample set as Drum Werks XXI. All ACIDized WAV, and APPLE loop formats included for download option and for hard copy DVD purchases. Drum Werks XXII: Ska Drum Loops: Read what MusicTech Magazine had to say about these loops.